It’s a strange month March, full of loss and anticipation. We have come to the end of the game season and winter roots, but spring and summer produce is just on the horizon. March does have some perks though, like tender forced rhubarb from Yorkshire, sweet purple sprouting broccoli, wild garlic in every nook and cranny with wood sorrel and wild nettles just starting to show themselves too. One thing I’m most looking forward to seeing is the first spears of asparagus but as soon as it arrives, I start counting the days, knowing it will all be over soon and there will be another long wait to get my hands on it again. Of course you can get Peruvian Asparagus all year round, but it's not the same. With a more woody and bitter taste compared to its British counter part and lacklustre in the texture department, it's also imported from the other side of the globe and so it's wrong on many levels! The beautiful green spears of British asparagus are full of flavour and loveliness and are also packed full of rich nutrients such as vitamin C, K, folic acid, fibre and vitamin E to name a few. Once asparagus is harvested, it needs to be eaten as soon as possible because it rapidly loses flavour and tenderness. Buy local asparagus wherever possible so you know it's not long been on the shelf and is best eaten the day it's picked. I know growing season is not here just yet, it's still blistering cold outside but it will soon be upon us. Asparagus season runs from 23rd of April (St George’s Day) to the longest day in June as a rule, but will always depend on the current climate. Once it gets going it can grow fast, up to 10cm a day in good weather, so keep your eyes peeled as it could be gone before you blink! Renowned as an aphrodisiac, I think you'll find cooking for your partner rather than the asparagus itself will help with that desired effect! There are many ways to cook, eat and serve this little gem; whether it's shaved raw into a salad, boiled and served with some homemade hollandaise, char-grilled or roasted with many paring combinations. Whatever you do, keep it simple so this marvellous spear can speak for itself. 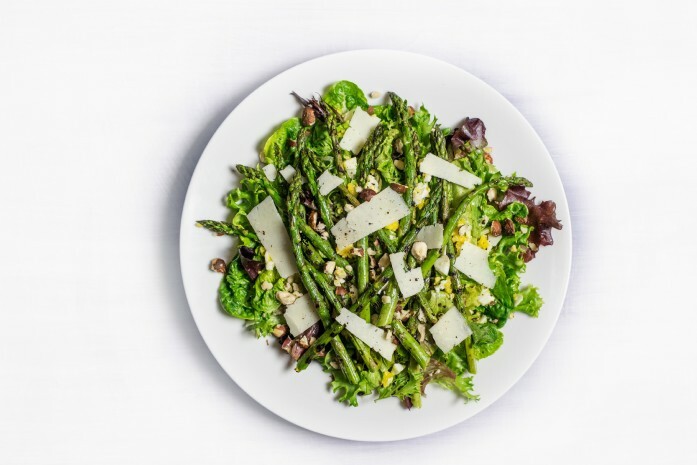 Lightly drizzle some extra virgin olive oil over the asparagus and season lightly with cracked black pepper and flaked sea salt. Place onto a hot char-grill pan, allow it to blacken its lines before turning over, then take off once it's just tender at the stem. Serve with a little squeeze of lemon and curd cheese or some shaved hard Quicke’s goat’s cheese. To enjoy as a light lunch, blanch the asparagus in salted boiling water until it's just tender. Toss in a little rapeseed oil and season with black pepper and sea salt and serve as soldiers with a soft boiled egg. South West private chef consultant, Joe, works with an emphasis on local, seasonal, wild, organic and sustainable produce.